Today after school I went to Kristen’s house to play. We went out side and David (Kristen’s little brother) started following us. Kristen said “David you’d better not be following us.” David said he wasn’t, but he was! We knew it too. So we where running away from him in their pinetrees. Then Kristen had to go to bathroom. I hid in the grain room of the chicken house. I saw 3 mice one I saw once and another one I saw 5 times. Then we went and layed on her bed and talked about the boys we like. It was fun. Today in school at work time I did a bunch of reading work book pages 3 math sheets 1 spelling book page 2 handwriting pages and one S.R.A. story. We saw a film it was about Hershey’s Choloclate, from cocoa bean pod in Nigira to candy in our stores in the U.S.A. My teacher said we could pick what we wanted from a bunch of things one was Meteorites and Metores and another Comets. I had trouble deciding on the two, finly I decied on Comets. I learned a lot. Halley’s Comet can be seen every 75 to 77 years the last time was in 1910 the next time will be 1985 to 1987. A comet’s tail has gases around it, when it goes past the sun the tail get more gases the radetion of the sun makes the whole tail glow with light we can see it from hear. I gave Neil a school picture of me. Today after school I went out in the medow and followed 3 streams then one more that run from someone else’s property, that was 4 creeks running together like this. (map) Three of them made a small pond and part of it was swampy. I got a stone from the creek to be my pet rock. I named it Neil. It was very muddy! And when I steped close to the little pond to wash it off, I sunk in to the mud almost to my knee, I tried to pull it out, and I sat right down in the mud. I got up quickly and got my foot out, but then my other foot got stuck. I pulled it out and stood some plase else to wash off Neil. Today I helped daddy in the chicken house. I made a secret hide out behind some hey bals, it’s neat! I menshind to daddy I wanted a pigin bad! So tonight daddy and I went pigin hunting. He got me one. When I went in to show Mommy daddy caught me two more two are gray-blue one is white with brown spots on it’s head and wings. I named the one gray-blue one Charcole and the white one I named Vanalla but I didn’t deside a name for the other gray-blue one. 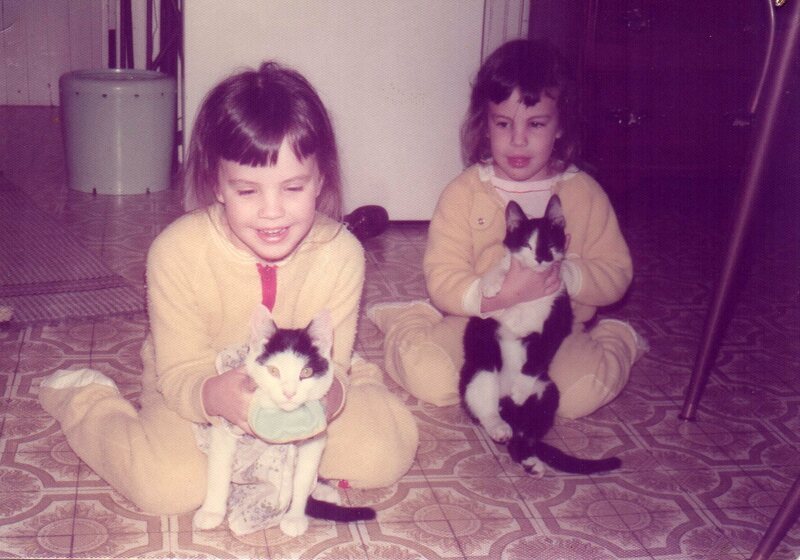 Me with my kitten Cutie and Wanda with Andrew, hers piously named after the pastor at church. Today I went outside to play in the snow again it was a lot better sledding. I went down the hill got to the bottem hit the bump flew up in the air came down again hit another bump and smack right into a wire fence! Then I stopped. This past week we had revivle meetings at our church. Roy Kizer was the Evanglist. Today I made Wanda a butten neckless for her birthday. We have a club Kristen and Emily and I, called a DYNAMITE club. We have a clubhouse in the barn and no one else can go there. I have 12 penpals. Today I helped daddy in the chicken house. We wached Little House on the Praire Laura got a test on history but Nellie hadn’t given her the history book, she got mad and threw Nellie in the muddy water, they both got very muddy. Almonzo came and resqued Laura, Laura went to Almonzo’s house. Pa came and gave Almonzo two good punches. in the farmhouse kitchen before the remodel. I kept the little red notebook that mom gave me on my night stand tucked under my Bible on the shelf below the lamp and the kleneex box. I can’t say how I came to feel, at the age of nine, that it was important for me to record and remember the things that happened to me or how it was that I knew writing things down was a way of laying them down; of being able to clear my mind and heart for whatever the next day would bring. But as you will see, I clearly knew all of that. 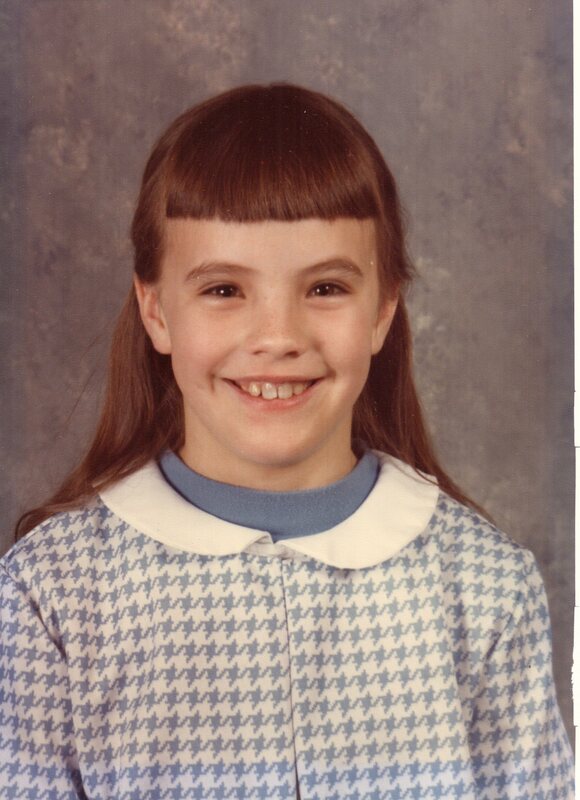 At nine I was bravely suffering the joyful misery of unrequited love for a boy named Neil in my second grade class. 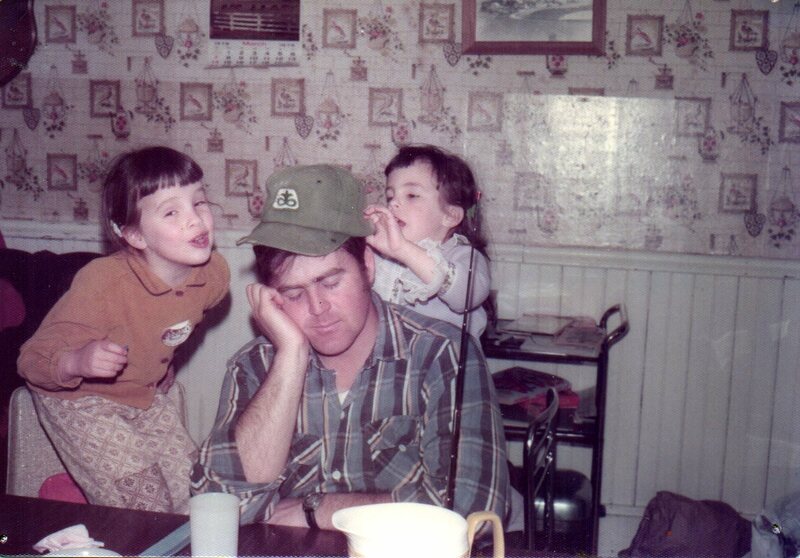 I loved animals, fishing, playing outside and going to school. Today I stayed home from school. I was sick. We watched Little House On the Praire. Laura met Almanzo. Nellie had her own restrant but she didn’t like to cook! Today I went to school for the first time in a week and a day. We are studying Niagra. I like Neil. My teacher is Mrs. Mentzer, sometimes she is nice. I sit in the back row in school. My reading book is Lippencot 3:1. My best friend is Karen. In school I sit next to Cory Gibble. 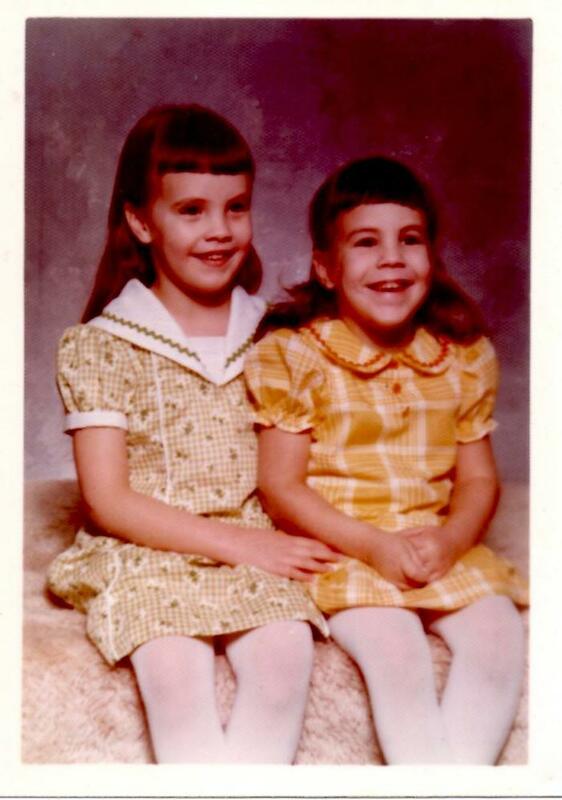 My sister Wanda and I, about 1975 wearing dresses mom made for us.